I baked for the first time in ages last weekend. We were going to a friend's house for dinner and I wanted to take a little bit for dessert. It was actually a very special dessert, in that I had been on a search for a recipe for Almond Horns ever since I tasted my first six one three years ago at the Mirabelle Bakery in Urbana, Illinois. 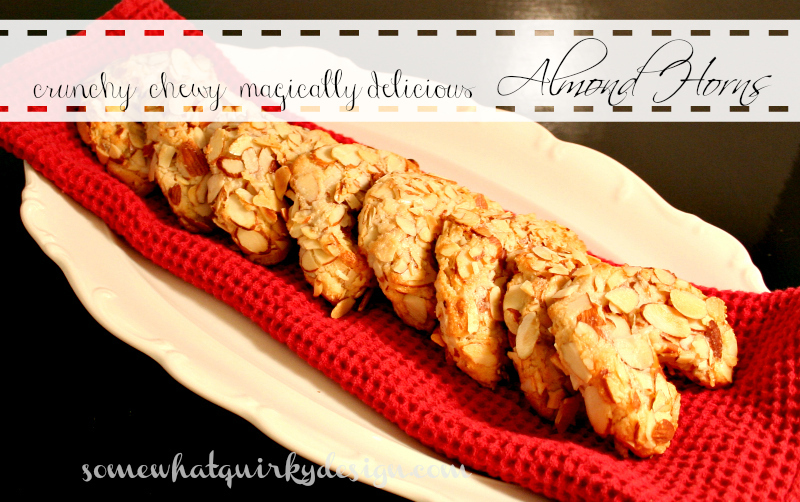 My friend Jennifer is quite a fan of all things almond and had fallen hard for these little gems many years ago. She had spent a bit of time herself looking for a recipe that tasted just like the ones from that bakery in downtown Urbana. She never found one and neither did I. So we just ate as many as possible whenever we had a way to get some. A few months ago I finally came across a recipe somewhere - probably Pinterest. It seems that Lindsay at love & olive oil had been looking for a recipe for the last several years as well. She thought the only reason she couldn't find it was because she had been looking for "almond crescents"... but I know it didn't do any good to look under Almond Horns either. She doesn't say where she ended up finding the recipe, but I'm glad she did. I pinned the recipe to my secret board and waited for the right opportunity to surprise Jennifer with a pan of fresh Almond Horns. The words that come to mind when I eat these - magically delicious. Oh, by the way Almond Horns are supposed to have one half of the horn dipped in chocolate. I find that completely unnecessary. You can make up your own mind. 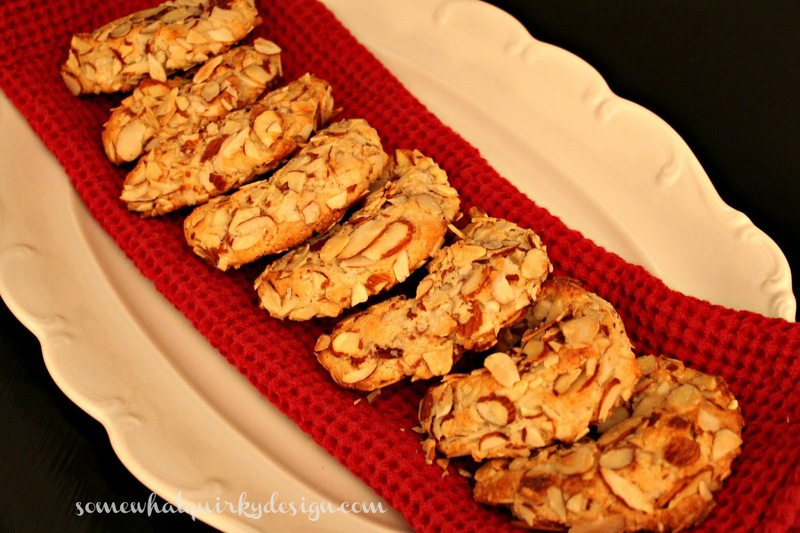 The recipe refers to them as cookies, but they are really more like a pastry. The size is about that of a small croissant. Line one baking sheet with parchment paper. Set aside. 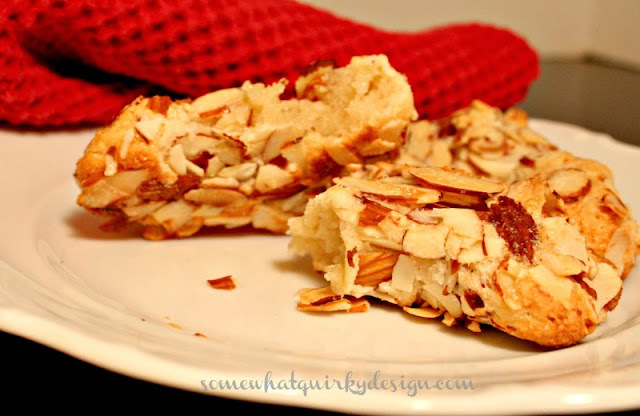 In a bowl or the bowl of a stand mixer, break almond paste into almond-sized chunks. Add sugar, almond flour and 3 tablespoons of beaten egg white mixture and mix on medium-low until combined. 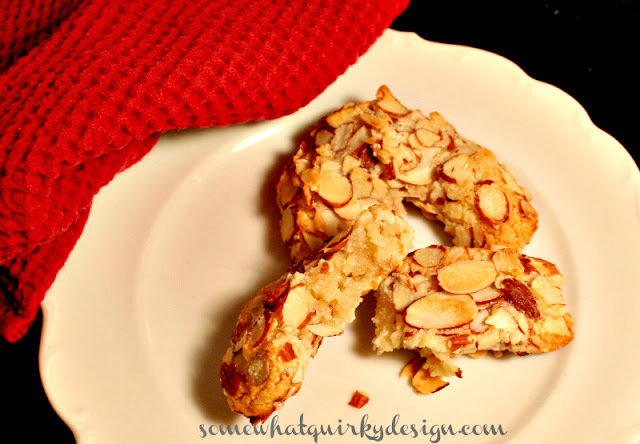 Pour sliced almonds onto a shallow dish or plate. Divide dough into 6 even balls (approximately 50 grams each) I divided my dough into 8 pieces to make 8 cookies. A large, 3 tablespoon cookie scoop is approximately the right size for 6. Drop one ball into the sliced almonds. Roll, using the almonds to prevent the dough from sticking to your hands, into a 4-inch log. Transfer to a parchment-lined baking sheet, and gently shape into a crescent, pressing down to flatten slightly. Repeat with remaining dough. Preheat your oven to 375 degrees F. Let cookies sit, uncovered, for 30 minutes, then brush with egg white mixture. Bake for 15 to 18 minutes or until bottoms are golden brown. Remove from oven and let cool on cookie sheet while you prepare the glaze. Or if you are me, start eating your almond horns. Remove from heat and quickly dip cooled cookies into glaze. Return to baking sheet and let sit for 30 minutes until glaze is set. Cookies will keep covered in an airtight container for up to 1 week. See how yummy they look on the inside? They are so yummy. And naturally gluten free if that matters to you. Who had the self control to find out how long they will last for a week in an airtight container? Further, what is wong with that person? I remember these from a long ago bakery. Thanks for the recipe! I have a recipe for these that I make at Christmas, but your sound better. So I will try them. But only one. Or seven. If you are not traveling through Urbana on your way here, then please make me these! Pinned it because they look delish. At first iw as all.."only 6 cookies??" but then I was thinking maybe 6 is plenty! I could double it in an emergency!! These sound so yummy. Had to pin it!! Well look at you - you're a baker too!!! Looks delicious Karen - mouth wateringly!!! I don't cook, but I do bake and those look so yummy!